Memories can take you back and make you happy or sad, or perhaps both. My teenage years were happy and in some moments sad because I had to leave my old life, my friends, my things behind and move to another continent. The thought of losing my best friend was such a scary to me and I went through roller-coaster of emotions when we said last goodbyes to each other at my doorsteps because I couldn’t handle seeing her at the airport. We grow up together, but when we entered the high school years, we were inseparable. I couldn’t wait until the dinner time was over so I could meet her half way from our houses and take a long walk. We would sit on the freshly cut grass under the bright stars on the hill, where we could see the whole city light up. Both of us shared every detail of our day, our school rushes and crushes and than imagined what will our future turn out to be! I miss my friend, even though we talk almost every day it is not the same when you don’t see them for long 14 years. I still remember our mini parties and sleepovers when she would make a pizza for every occasion…we would spend the night in laughter, making goofy photos, and having fun like each moment was our last one. Those are the memories that are making me happy and little bit sad, because we missed so much over these long years, but still we never forgot our silly teenage days. Recently she gave me this recipe and I wanted to share with all of you. I hope you will like it as much as my family did! Wash the Zucchini and using potato peeler slice into thin slices; If you slice that thin you can use few slices of zucchini to be more full, i haven’t done that but you can if you wish. Roll the zucchini around your finger and put in a greased baking pan. Preheat the oven on 375 degrees Fahrenheit and start preparing the egg mixture. In a food processor put all the unused zucchini and process until you have almost paste looking zucchini; Add Feta and 1 Tbs. Sour cream, pinch of salt and mix. In the other bowl mix eggs, feta, sour cream, cottage cheese, heavy whipped cream, pinch of baking soda, salt and pepper to taste; mix but don’t over beat. Take a spoonful of processed zucchini and stuff each zucchini roll, once you are done pour eggs mixture on top slice the sweet peppers and put in the middle of each roll, but like I said it is optional. Bake for the next 35-40 minutes or until the top is turning brown, but if you see that it looks done after 40 minutes and still very light on the top, you can turn on the broil and just let it get darker. Let it cool down for few minutes but serve it hot and immediately! once it is done with peeler. 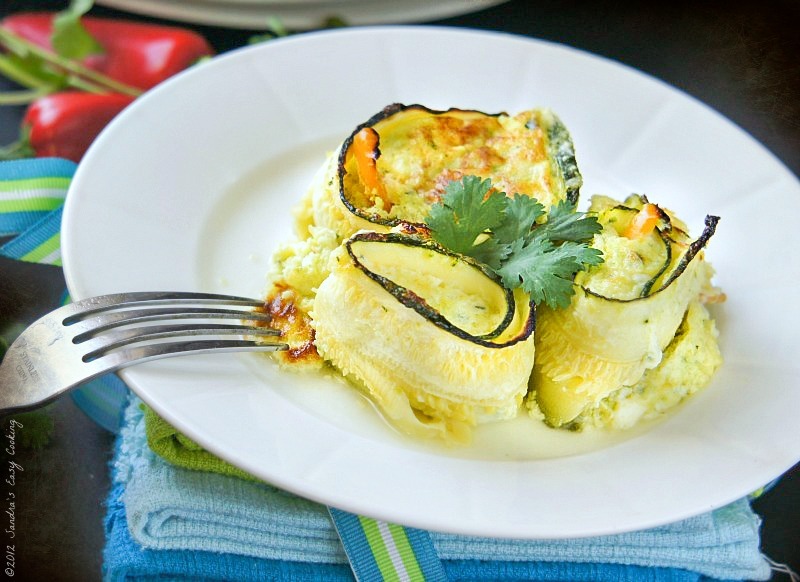 Just roll several lengthwise slices of zucchini before placing the filling in! Use potato peeler to slice the zucchini for better rolling. 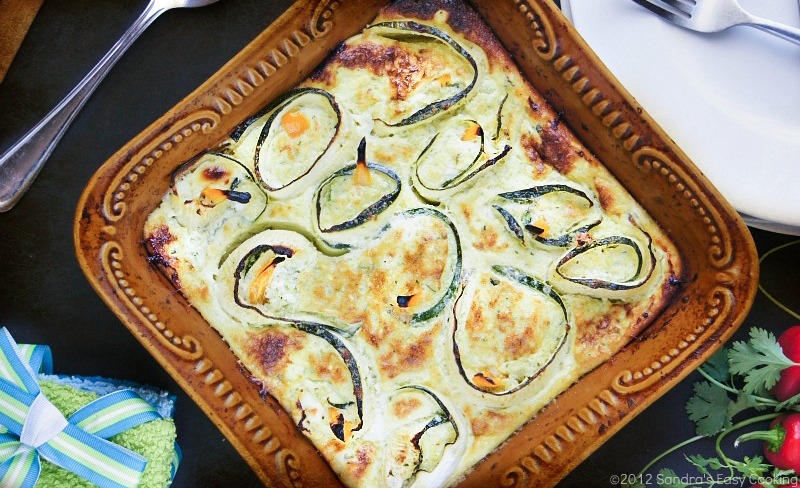 you can stuff zucchini with whatever you wish, use more processed veggies, or perhaps meat. Cheese and Eggs together with zucchini will produce bit of liquid on the end, don’t worry, it is normal! 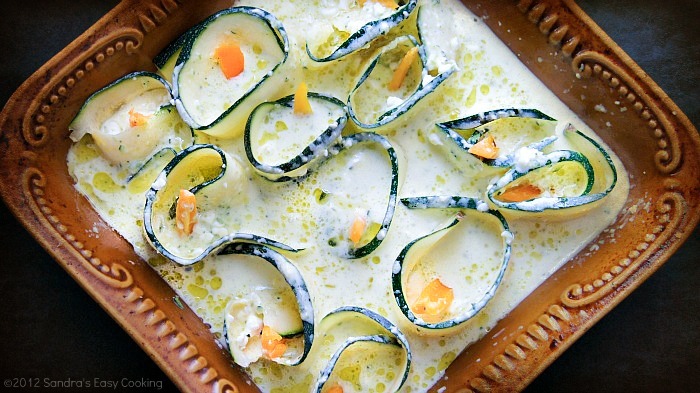 The recipe is easy, as long as the zucchini is sliced in a thin slices. I lost my peeler! Who knows what happen to it. I am guessing that I dumped it accidentally in the trash, so I used the knife instead. It wasn’t easy at all to roll it…but now you know, use the peeler and it will come out better. However, to be honest with you I actually like the uneven looking rolls. They are more appealing and real to me, rather than picture perfect. Food that you see on my photos are real, and of course we eat it right after the photo-shoot so there is absolutely nothing artificial, or uneatable! Sending you all virtual hugs, stay safe this Summer!